It is with great sadness that the family of Marion H (Shiminitz) Saldon announces her passing on Monday, March 18, 2019 at the age of 84 years at her home in Santa Rosa Beach Florida. Marion was born on July 11, 1934 to Michael and Susan Shiminitz. She grew up in Wilkes-Barre PA, and graduated from Coughlin High School in 1952. She attended the Wilkes-Barre General Hospital Diploma Nursing program and graduated in 1955. During her nursing career, she worked as a staff nurse at the Wilkes-Barre General Hospital in PA, Somerset Medical Center in Somerville NJ, and Somerset Valley Nursing Home in Bound Brook NJ. Marion received her School Nurse Certification from Trenton State College and was employed for 25 years as a school nurse at Stony Brook School in Branchburg NJ. She retired in 1996. During her life, she enjoyed traveling with her friends, family, and sister Eleanor. She enjoyed going out dancing with her friends, bowling and gambling at the Casinos in NJ and PA. But most importantly, she enjoyed playing games with her grandchildren. She was an avid dog lover, and her “Spotty” will miss her dearly. Marion is survived by her 4 children, David Saldon (Antoinette), Dawn Buzan (Forrest), Diane Sands, and Terry Warburton (Keith) and 8 grandchildren, Derek Sands, Ellysa Warburton, Nicole Killman, Dylan Sands, Jefferson Buzan, Jesse Warburton, Christopher Buzan, and David Saldon Jr. Her sister Eleanor Carr also survives her. Marion was preceded in death by her parents Michael Shiminitz and Susan Shiminitz of Wilkes-Barre PA and her ex-husband Richard Saldon of Pinehurst NC. Viewing will be held at the Branchburg Funeral Home (910 US-202 South Branchburg, NJ 08876) on Sunday, March 24, 2019 from 1-3pm. A funeral mass at Holy Trinity Church (60 Maple St. Bridgewater, NJ 08807) will be held at 10am on Monday, March 25, 2019. She will be laid to rest at St. Mary’s Byzantine Catholic Cemetery in Dallas, PA following the mass. 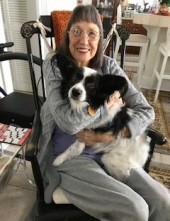 In lieu of flowers, donations in memory of Marion may be sent to Vitas Hospice, Niceville, FL (https://vitascommunityconnection.org ) or to the ASPCA. To send flowers or a remembrance gift to the family of Marion Saldon, please visit our Tribute Store. "Email Address" would like to share the life celebration of Marion Saldon. Click on the "link" to go to share a favorite memory or leave a condolence message for the family.